Swansea City eased into the second round of the Carling Cup, brushing aside Barnet with an impressive first win under new manager Brendan Rodgers. After Shefki Kuqi missed an early penalty, Cedric van der Gun made the breakthrough as he headed home a fine cross from Albert Serran. Nottingham Forest transfer target Darren Pratley came off the bench to double Swansea's lead with a fine solo. Kuqi made amends for his miss with a late third to underline Swansea's win. Their reward is a trip to League One side Tranmere Rovers in the second round, meaning they missed out on a glamour tie against one of the Premier League clubs. Swansea started strongly and Barnet were given a let off as early as the 19th minute at the Liberty Stadium when Kuqi hit the crossbar with a penalty kick after Sam Cox had brought down Van der Gun in the area. The League Two visitors could again count themselves lucky just two minutes later when Kerry Morgan again smashed the Barnet bar with an ambitious shot from distance. But the Bees defence was finally breached as Van der Gun headed home Serra's right-wing cross from close range, following good work from Joe Allen in midfield. Swansea were more comfortable in possession after the opener, although Barnet were certainly not out of it heading into the second half. But Rodgers' side were firmly on the front foot as they went in search of a crucial second, Van der Gun, Morgan and Allen all going close. The second goal finally arrived via Pratley in the 72nd minute as the in-demand ex-Fulham trainee capped a driving run with an unstoppable shot past Jake Cole. The midfielder took off his shirt and celebrated fiercely in what appeared to be a show of loyalty to the home fans. Kuqi missed a sitter from 12 yards as the game entered the closing stages before finally finding the net at the third attempt, rounding off a successful evening for Swans boss Rodgers in what was his first competitive game at the Liberty Stadium. 94:17 The referee gets the game underway. 90:00+3:39 Goal kick taken long by Jake Cole (Barnet). 90:00+2:40 Attacking throw-in by Joe Walsh (Swansea). 90:00+0:46 Outswinging corner from right by-line taken left-footed by Glenn Poole (Barnet) to centre, clearance by Albert Serran (Swansea). 90:00+0:23 Shot by Jordan Parkes (Barnet) right-footed from right channel (30 yards), save (caught) by Dorus De Vries (Swansea). 89:40 Outswinging corner from left by-line taken left-footed by Ricky Holmes (Barnet) to far post, resulting in open play. 89:01 Foul by Shefki Kuqi (Swansea) on Glen Southam (Barnet). Direct free kick taken right-footed by Glen Southam (Barnet) from right channel, resulting in open play. 87:53 Assist (pass) by Garry Monk (Swansea) from own half. 87:53 GOAL - Shefki Kuqi:Swansea 3 - 0 Barnet Goal by Shefki Kuqi (Swansea) right-footed (bottom-right of goal) from centre of penalty area (12 yards).Swansea 3-0 Barnet. 87:24 Goal kick taken short by Dorus De Vries (Swansea). 87:09 Shot by Danny Kelly (Barnet) left-footed from left channel (20 yards), over the bar. 86:19 Goal kick taken long by Jake Cole (Barnet). 86:04 Shot by Andrea Orlandi (Swansea) left-footed from left channel (20 yards), over the bar. 85:08 Goal kick taken long by Jake Cole (Barnet). 84:53 Shot by Shefki Kuqi (Swansea) right-footed from centre of penalty area (12 yards), missed left. 82:50 Attacking throw-in by Joe Walsh (Swansea). 81:58 Attacking throw-in by Jordan Parkes (Barnet). 81:49 Attacking throw-in by Ricky Holmes (Barnet). 81:18 Attacking throw-in by Jordan Parkes (Barnet). 81:09 Defending throw-in by Jordan Parkes (Barnet). 80:38 Foul by Anwar Uddin (Barnet) on Shefki Kuqi (Swansea). Direct free kick taken right-footed by Dorus De Vries (Swansea) from own half, resulting in open play. 79:53 Direct free kick taken left-footed by Glenn Poole (Barnet) from left channel, resulting in open play. 79:53 Booking Garry Monk (Swansea) booked for unsporting behaviour. 79:53 Foul by Garry Monk (Swansea) on Ricky Holmes (Barnet). 78:50 Defending throw-in by Albert Serran (Swansea). 78:40 Attacking throw-in by Daniel Leach (Barnet). 77:39 Outswinging corner from right by-line taken right-footed by Mark Gower (Swansea) to near post, clearance by Glen Southam (Barnet). 77:32 Cross by Nathan Dyer (Swansea), clearance by Darren Dennehy (Barnet). 77:15 Foul by Darren Dennehy (Barnet) on Andrea Orlandi (Swansea). Direct free kick taken right-footed by Mark Gower (Swansea) from right channel, passed. 74:12 Direct free kick taken right-footed by Glen Southam (Barnet) from right channel, resulting in open play. 74:12 Booking Shefki Kuqi (Swansea) booked for unsporting behaviour. 74:12 Booking Alan Tate (Swansea) booked for unsporting behaviour. 74:12 Foul by Alan Tate (Swansea) on Jordan Parkes (Barnet). 73:18 Substitution Swansea substitution: Kerry Morgan replaced by Nathan Dyer (tactical). 71:06 GOAL - Darren Pratley:Swansea 2 - 0 Barnet Free kick scored by Darren Pratley. Swansea 2-0 Barnet. Correction - 70:20 GOAL - Darren Pratley:Swansea 2 - 0 Barnet Free kick scored by Darren Pratley (Swansea) right-footed (top-right of goal) from right side of penalty area (12 yards).Swansea 2-0 Barnet. Correction - 70:20 Foul by Darren Dennehy (Barnet) on Shefki Kuqi (Swansea). 70:20 Assist (pass) by Andrea Orlandi (Swansea) from right channel. 70:20 Foul by Darren Dennehy (Barnet) on Shefki Kuqi (Swansea). Direct free kick taken right-footed by Andrea Orlandi (Swansea) from left channel, passed. 70:03 Shot by Mark Byrne (Barnet) left-footed from left side of penalty area (18 yards), over the bar. 69:31 Inswinging corner from right by-line taken left-footed by Glenn Poole (Barnet) to near post, clearance by Dorus De Vries (Swansea). 69:11 Shot by Ricky Holmes (Barnet) right-footed from right side of penalty area (18 yards), save (caught) by Dorus De Vries (Swansea). 68:37 Goal kick taken long by Jake Cole (Barnet). 68:22 Shot by Kerry Morgan (Swansea) left-footed from right channel (25 yards), missed right. 68:02 Goal kick taken long by Jake Cole (Barnet). 67:11 Cross by Cedric Van der Gun (Swansea), header by Kerry Morgan (Swansea) from centre of penalty area (12 yards), missed right. 66:36 Outswinging corner from left by-line taken left-footed by Andrea Orlandi (Swansea) to far post, clearance by Anwar Uddin (Barnet). 66:02 Shot by Shefki Kuqi (Swansea) left-footed from left channel (25 yards), blocked by Anwar Uddin (Barnet). 65:28 Attacking throw-in by Daniel Leach (Barnet). 64:50 Goal kick taken long by Jake Cole (Barnet). 64:31 Attacking throw-in by Joe Walsh (Swansea). 64:10 Substitution Barnet substitution: Mark Hughes replaced by Danny Kelly (tactical). 63:48 Foul by Mark Hughes (Barnet) on Darren Pratley (Swansea). Direct free kick taken left-footed by Kerry Morgan (Swansea) from right channel, passed. 63:29 Foul by Mark Hughes (Barnet) on Darren Pratley (Swansea). Direct free kick taken right-footed by Alan Tate (Swansea) from own half, passed. 63:06 Substitution Barnet substitution: Mark Marshall replaced by Danny Hart (tactical). 61:57 Substitution Swansea substitution: Scott Donnelly replaced by Darren Pratley (tactical). 61:57 Substitution Swansea substitution: Joe Allen replaced by Mark Gower (tactical). 61:40 Shot by Cedric Van der Gun (Swansea) right-footed from left side of penalty area (12 yards), missed right. 61:12 Goal kick taken short by Dorus De Vries (Swansea). 60:59 Attacking throw-in by Daniel Leach (Barnet). 60:19 Defending throw-in by Albert Serran (Swansea). 59:57 Attacking throw-in by Daniel Leach (Barnet). 59:44 Goal kick taken long by Jake Cole (Barnet). 59:21 Shot by Kerry Morgan (Swansea) left-footed from right channel (25 yards), over the bar. 59:00 Foul by Mark Hughes (Barnet) on Andrea Orlandi (Swansea). Direct free kick taken left-footed by Andrea Orlandi (Swansea) from right channel, passed. 58:20 Shot by Andrea Orlandi (Swansea) left-footed from left channel (25 yards), save (caught) by Jake Cole (Barnet). 57:51 Mark Marshall (Barnet) caught offside. Direct free kick taken right-footed by Dorus De Vries (Swansea) from own half, passed. 56:55 Attacking throw-in by Joe Walsh (Swansea). 56:20 Cross by Andrea Orlandi (Swansea), clearance by Anwar Uddin (Barnet). 55:56 Attacking throw-in by Joe Walsh (Swansea). 55:05 Outswinging corner from left by-line taken left-footed by Andrea Orlandi (Swansea) to near post, clearance by Darren Dennehy (Barnet). 54:43 Shot by Joe Allen (Swansea) right-footed from left channel (25 yards), save (caught) by Jake Cole (Barnet). 54:16 Cross by Cedric Van der Gun (Swansea), clearance by Darren Dennehy (Barnet). 54:03 Defending throw-in by Jordan Parkes (Barnet). 53:34 Defending throw-in by Jordan Parkes (Barnet). 52:38 Direct free kick taken left-footed by Andrea Orlandi (Swansea) from right channel, resulting in open play. 52:38 Booking Daniel Leach (Barnet) booked for unsporting behaviour. 52:38 Foul by Daniel Leach (Barnet) on Andrea Orlandi (Swansea). 52:08 Defending throw-in by Joe Walsh (Swansea). 51:47 Attacking throw-in by Jordan Parkes (Barnet). 50:59 Inswinging corner from right by-line taken left-footed by Andrea Orlandi (Swansea) to centre, clearance by Darren Dennehy (Barnet). 49:51 Direct free kick taken right-footed by Garry Monk (Swansea) from right channel, passed. 49:51 Booking Mark Byrne (Barnet) booked for unsporting behaviour. 49:51 Foul by Mark Byrne (Barnet) on Joe Allen (Swansea). 48:07 Attacking throw-in by Daniel Leach (Barnet). 47:36 Cross by Kerry Morgan (Swansea), clearance by Anwar Uddin (Barnet). 47:12 Goal kick taken short by Dorus De Vries (Swansea). 46:48 Shot by Mark Marshall (Barnet) right-footed from right side of penalty area (18 yards), over the bar. 46:27 Goal kick taken long by Jake Cole (Barnet). 46:06 Shot by Alan Tate (Swansea) left-footed from left channel (30 yards), missed right. 45:01 Substitution Barnet substitution: Sam Cox replaced by Jordan Parkes (tactical). 43:21 Shot by Scott Donnelly (Swansea) right-footed from left channel (20 yards), save (caught) by Jake Cole (Barnet). 42:36 Inswinging corner from right by-line taken left-footed by Glenn Poole (Barnet) to near post, clearance by Joe Walsh (Swansea). 41:42 Corner from right by-line taken short left-footed by Glenn Poole (Barnet). Shot by Andrea Orlandi (Swansea) left-footed from right channel (20 yards), save (caught) by Dorus De Vries (Swansea). 40:39 Goal kick taken short by Dorus De Vries (Swansea). 40:31 Attacking throw-in by Mark Marshall (Barnet). 40:25 Cross by Mark Marshall (Barnet), clearance by Albert Serran (Swansea). 39:37 Inswinging corner from right by-line taken left-footed by Andrea Orlandi (Swansea) to near post, clearance by Mark Hughes (Barnet). 39:09 Attacking throw-in by Joe Walsh (Swansea). 37:45 Attacking throw-in by Joe Walsh (Swansea). 37:35 Attacking throw-in by Joe Walsh (Swansea). 36:38 Cross by Joe Walsh (Swansea), save (caught) by Jake Cole (Barnet). 36:02 Cross by Alan Tate (Swansea), clearance by Anwar Uddin (Barnet). 35:42 Outswinging corner from left by-line taken left-footed by Andrea Orlandi (Swansea) to centre, clearance by Darren Dennehy (Barnet). 35:28 Shot by Kerry Morgan (Swansea) left-footed from left channel (20 yards), blocked by Sam Cox (Barnet). 33:27 Defending throw-in by Joe Walsh (Swansea). 33:08 Attacking throw-in by Sam Cox (Barnet). 32:38 Defending throw-in by Sam Cox (Barnet). 30:52 Defending throw-in by Sam Cox (Barnet). 29:23 Handball by Mark Marshall (Barnet). Direct free kick taken left-footed by Joe Walsh (Swansea) from own half, passed. 29:09 Attacking throw-in by Glenn Poole (Barnet). 27:02 Goal kick taken short by Dorus De Vries (Swansea). 26:48 Shot by Mark Byrne (Barnet) left-footed from left side of penalty area (6 yards), missed left. 26:11 Attacking throw-in by Daniel Leach (Barnet). 25:38 Inswinging corner from right by-line taken left-footed by Glenn Poole (Barnet) to far post, clearance by Garry Monk (Swansea). 25:02 Foul by Joe Allen (Swansea) on Mark Byrne (Barnet). Direct free kick taken left-footed by Glenn Poole (Barnet) from left channel, resulting in open play. 24:36 Attacking throw-in by Daniel Leach (Barnet). 24:18 Defending throw-in by Albert Serran (Swansea). 23:21 Assist (cross) by Albert Serran (Swansea) from right wing. 23:21 GOAL - Cedric Van der Gun:Swansea 1 - 0 Barnet headed goal by Cedric Van der Gun (Swansea) (bottom-left of goal) from left side of penalty area (6 yards).Swansea 1-0 Barnet. 22:11 Attacking throw-in by Kerry Morgan (Swansea). 21:37 Mark Marshall (Barnet) caught offside. Direct free kick taken left-footed by Joe Walsh (Swansea) from own half, passed. 21:19 Attacking throw-in by Sam Cox (Barnet). 20:54 Goal kick taken long by Jake Cole (Barnet). 20:21 Cross/shot by Kerry Morgan (Swansea) left-footed from right channel (25 yards), over the bar. 19:57 Attacking throw-in by Joe Walsh (Swansea). 17:21 Power penalty taken right-footed by Shefki Kuqi (Swansea) (over the bar), missed.Swansea 0-0 Barnet. 17:21 Foul by Sam Cox (Barnet) on Cedric Van der Gun (Swansea). 16:08 Defending throw-in by Sam Cox (Barnet). 15:31 Foul by Mark Byrne (Barnet) on Joe Allen (Swansea). Direct free kick taken right-footed by Albert Serran (Swansea) from own half, passed. 14:32 Foul by Andrea Orlandi (Swansea) on Mark Byrne (Barnet). Direct free kick taken right-footed by Jake Cole (Barnet) from own half, resulting in open play. 13:50 Attacking throw-in by Joe Walsh (Swansea). 13:32 Goal kick taken long by Jake Cole (Barnet). 13:20 Shot by Kerry Morgan (Swansea) right-footed from left channel (25 yards), over the bar. 13:03 Shot by Kerry Morgan (Swansea) left-footed from left channel (20 yards), blocked by Anwar Uddin (Barnet). 12:17 Direct free kick taken left-footed by Andrea Orlandi (Swansea) from left channel, resulting in open play. 12:17 Booking Mark Hughes (Barnet) booked for unsporting behaviour. 12:17 Foul by Mark Hughes (Barnet) on Albert Serran (Swansea). 11:41 Attacking throw-in by Albert Serran (Swansea). 10:23 Shot by Shefki Kuqi (Swansea) left-footed from right channel (20 yards), save (caught) by Jake Cole (Barnet). 9:46 Attacking throw-in by Albert Serran (Swansea). 9:17 Attacking throw-in by Joe Walsh (Swansea). 8:24 Shot by Glenn Poole (Barnet) left-footed from left side of penalty area (6 yards), save (caught) by Dorus De Vries (Swansea). 7:10 Shot by Ricky Holmes (Barnet) left-footed from left side of penalty area (6 yards), save (caught) by Dorus De Vries (Swansea). 6:54 Attacking throw-in by Daniel Leach (Barnet). 6:29 Defending throw-in by Daniel Leach (Barnet). 6:16 Goal kick taken short by Dorus De Vries (Swansea). 6:03 Shot by Mark Byrne (Barnet) left-footed from left side of penalty area (18 yards), missed right. 4:02 Defending throw-in by Albert Serran (Swansea). 3:33 Attacking throw-in by Albert Serran (Swansea). 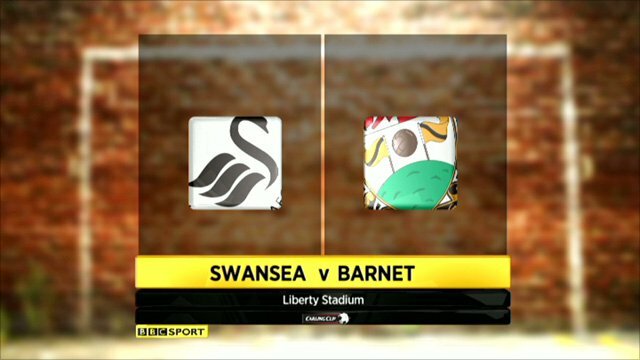 2:40 Foul by Mark Hughes (Barnet) on Scott Donnelly (Swansea). Direct free kick taken left-footed by Joe Allen (Swansea) from own half, passed. 2:16 Defending throw-in by Joe Walsh (Swansea). 2:07 Attacking throw-in by Sam Cox (Barnet). 1:50 Attacking throw-in by Sam Cox (Barnet). 1:20 Defending throw-in by Albert Serran (Swansea). 0:20 Foul by Mark Hughes (Barnet) on Joe Allen (Swansea). Direct free kick taken left-footed by Alan Tate (Swansea) from own half, passed.